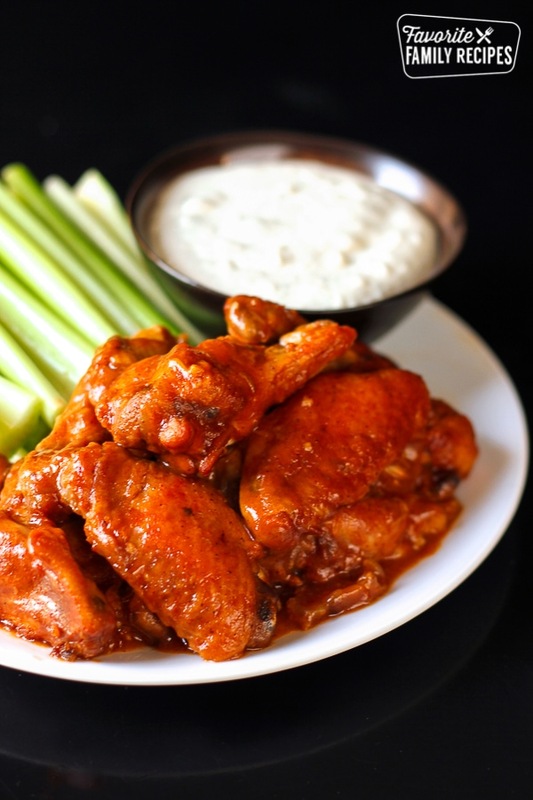 These Slow Cooker BBQ Hot Wings with Blue Cheese Dip will be a hit at your next party! The wings are slow-cooked in a perfect blend of seasoning and spices. These Slow Cooker BBQ Hot Wings with Blue Cheese Dip are going to be a hit at your next party! I love these because they have way more flavor than your typical hot wings that are just covered in hot sauce. And the blue cheese dip is out of this world good, again, way more flavorful than most! I like to cook these on high in the slow cooker for about 4 hours, but if you are wanting to get an earlier start you can also cook them on low for 6 to 7 hours. You just don’t want them to get over cooked because they will fall apart on you when you are dipping them in the sauce. Another tip is to make the blue cheese dip way ahead of time. At least a couple of hours! I like to make mine the night before, the longer it has to sit the more the flavors sink in. It is so incredibly yummy! I really like to use this same dip base for my blue cheese dressing on salads. You just cut the mayo and sour cream down to half a cup each and add a little milk, to desired dressing consistency. It is so good on our steak salad HERE. Mix water and liquid smoke in the bottom of a large slow cooker. Add frozen wings and sprinkle with kosher salt. Cook on high for about 4 hours. Mix together all the ingredients for the blue cheese dip except for the blue cheese crumbles. Then gently stir in the blue cheese. (You can also blend them in if you don't like big pieces of cheese). Refrigerate for at least a couple of hours, the longer the better- it just gets more flavorful. Just before wings are done cooking, add all sauce ingredients to a small sauce pan and bring to a boil. Reduce heat and simmer about 15 minutes. When wings are done cooking in the slow cooker, dip each wing in the sauce and place on a cookie sheet. Place in oven under the broiler on high for a couple of minutes, then dip each wing again and place on the cookie sheet again with the other side of the wing facing up. Place under the broiler again for a couple of minutes. Place wings on a serving plate and baste with the remaining sauce. Serve with blue cheese dip and celery. I used a 4 pound bag, but I had plenty of sauce left over. You could easily do 5 to 6 pounds of wings.